Gastric bypass and other weight-loss surgeries make changes to your digestive system to help you lose weight by limiting how much you can eat or by reducing the absorption of nutrients, or both. Gastric bypass and other weight-loss surgeries are done when diet and exercise haven't worked or when you have serious health problems because of your weight. Still, all forms of weight-loss surgery, including gastric bypass, are major procedures that can pose serious risks and side effects. Also, you must make permanent healthy changes to your diet and get regular exercise to help ensure the long-term success of bariatric surgery. When is adolescent bariatric surgery necessary? Adolescent bariatric surgery — Why Mayo Clinic? Gastric bypass and other weight-loss surgeries are typically done only after you've tried to lose weight by improving your diet and exercise habits. But gastric bypass isn't for everyone who is severely overweight. You may need to meet certain medical guidelines to qualify for weight-loss surgery. You likely will have an extensive screening process to see if you qualify. You must also be willing to make permanent changes to lead a healthier lifestyle. You may be required to participate in long-term follow-up plans that include monitoring your nutrition, your lifestyle and behavior, and your medical conditions. And keep in mind that bariatric surgery is expensive. Check with your health insurance plan or your regional Medicare or Medicaid office to find out if your policy covers such surgery. If you qualify for gastric bypass or other weight-loss surgeries, your health care team gives you instructions on how to prepare for your specific type of surgery. You may need to have various lab tests and exams before surgery. You may have restrictions on eating and drinking and which medications you can take. You may be required to start a physical activity program and to stop any tobacco use. You may also need to prepare by planning ahead for your recovery after surgery. For instance, arrange for help at home if you think you'll need it. Before gastric bypass, food (see arrows) enters your stomach and passes into the small intestine. After surgery, the amount of food you can eat is reduced due to the smaller stomach pouch. Food is also redirected so that it bypasses most of your stomach and the first section of your small intestine (duodenum). Food flows directly into the middle section of your small intestine (jejunum), limiting the absorption of calories. Gastric bypass and other types of weight-loss surgery are done in the hospital. General anesthesia is used for weight-loss surgery. This means you're unconscious during the procedure. The specifics of your surgery depend on your individual situation, the type of weight-loss surgery you have, and the hospital's or doctor's practices. Some weight-loss surgeries are done with traditional large, or open, incisions in your abdomen. Today, most types of bariatric surgery are performed laparoscopically. A laparoscope is a small, tubular instrument with a camera attached. The laparoscope is inserted through small incisions in the abdomen. The tiny camera on the tip of the laparoscope allows the surgeon to see and operate inside your abdomen without making the traditional large incisions. Laparoscopic surgery can make your recovery faster and shorter, but it's not suitable for everyone. Surgery usually takes several hours. After surgery, you awaken in a recovery room, where medical staff monitors you for any complications. Your hospital stay may last from three to five days. Roux-en-Y (roo-en-y). This is a type of gastric bypass surgery, and is the most common method of gastric bypass. This surgery is typically not reversible. It works by decreasing the amount of food you can eat at one sitting and reducing absorption of nutrients. The surgeon cuts across the top of your stomach, sealing it off from the rest of your stomach. The resulting pouch is about the size of a walnut and can hold only about an ounce of food. Normally, your stomach can hold about 3 pints of food. Then, the surgeon cuts the small intestine and sews part of it directly onto the pouch. Food then goes into this small pouch of stomach and then directly into the small intestine sewn to it. Food bypasses most of your stomach and the first section of your small intestine, and instead enters directly into the middle part of your small intestine. Biliopancreatic diversion with duodenal switch. This is another type of gastric bypass surgery. In this complex, multipart procedure, about 80 percent of the stomach is removed. The valve that releases food to the small intestine (the pyloric valve) remains, along with a limited portion of the small intestine that normally connects to the stomach (duodenum). 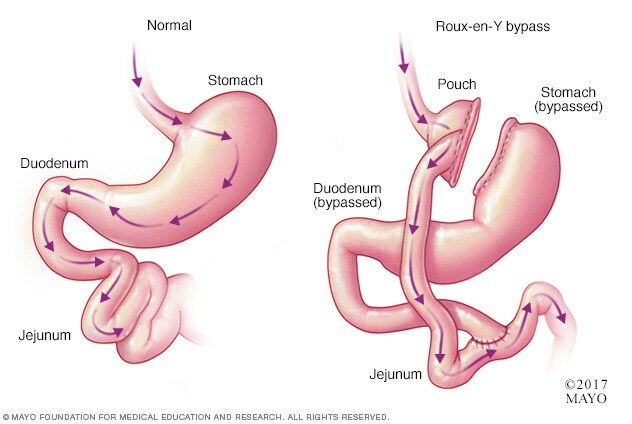 The surgery bypasses the majority of the intestine by connecting the end portion of the intestine to the duodenum near the stomach (duodenal switch and biliopancreatic diversion). This surgery both limits how much you can eat and reduces the absorption of nutrients. While it's very effective, it has more risks, including malnutrition and vitamin deficiencies. It's generally used for people who have a body mass index greater than 50. Laparoscopic adjustable gastric banding (LAGB). In this weight-loss surgery, the surgeon positions an inflatable band around the uppermost part of the stomach. When the band is inflated, it compresses the stomach, acting like a belt that tightens. This separates the stomach into two parts, with a very small upper pouch that communicates with the rest of the stomach through a channel created by the band. The small upper pouch limits the amount of food you can eat. The band can be adjusted so that it restricts more or less food. Because of its relative simplicity, LAGB is one of more common weight-loss surgeries. However, it may lead to less weight loss than may other procedures, and you may need to have the band adjusted periodically. Sleeve gastrectomy. A sleeve gastrectomy, also called a vertical sleeve gastrectomy, is a newer type of weight-loss surgery. The sleeve gastrectomy is actually the first part of the surgical process for a biliopancreatic diversion with duodenal switch. However, the sleeve gastrectomy portion of surgery may be all that's needed to lose sufficient weight — in some cases the second part, biliopancreatic diversion, isn't needed. With sleeve gastrectomy, the structure of your stomach is changed to be shaped like a tube, which restricts the amount of calories your body absorbs. Which type of weight-loss surgery is best for you depends on your specific situation. Your surgeon will take many factors into account, including your body mass index, your eating habits, your health problems, any previous surgery and the risks of each procedure. After gastric bypass and other types of weight-loss surgery, you generally won't be allowed to eat for one to two days so that your stomach and digestive system can heal. Then, you'll follow a specific diet for about 12 weeks. The diet begins with liquids only, then progresses to ground-up or soft foods, and finally to regular foods. You may have many restrictions or limits on how much and what you can eat and drink. Gastric bypass and other bariatric surgeries can provide long-term weight loss. The amount of weight you lose depends on your type of surgery and your change in lifestyle habits. It may be possible to lose half, or even more, of your excess weight within two years. Gastric bypass surgery can also improve your ability to perform routine daily activities, which could help improve your quality of life. Gastric bypass and other weight-loss surgeries don't always work as well as you might have hoped. For one thing, although rare, something during or after the procedure itself may go wrong. For instance, the adjustable band may fail to work properly. If a weight-loss procedure doesn't work right or stops working, you may not lose weight and you may develop serious health problems. Keep all of your scheduled follow-up appointments after weight-loss surgery. If you notice that you aren't losing weight or you develop complications, see your doctor immediately. Your weight loss can be monitored and factors potentially contributing to your lack of weight loss evaluated. It's also possible to not lose enough weight or to regain weight after any type of weight-loss surgery, even if the procedure itself works correctly. This weight gain can happen if you don't follow the recommended lifestyle changes. To help avoid regaining weight, you must make permanent healthy changes in your diet and get regular physical activity and exercise. If you frequently snack on high-calorie foods, for instance, you may have inadequate weight loss.